***** IMPORTANT: Dear Scientific Community, if you are planning to analyze EFW data, please inform John Wygant (EFW PI) of the nature of your study and which days you are looking at. This is important because there are a number of issues associated with the data that we may be aware of that will impact your study. We strongly recommend contacting us at the early stages of your work with the EFW data to avoid wasted effort. It is best not to wait until the time of submission or just before an AGU talk. In addition, scientists using EFW data are strongly encouraged to read RBSP/EFW Data Required Reading. This page contains useful information on EFW-specific coordinate systems (MGSE), error sources in the data, data caveats, intervals of spacecraft charging and hints on how to analyze the data (deriving spin-axis electric field from E • B = 0). ***** EFW Data Update (Feb. 9th, 2018): The EFW instrument receives uncalibrated (telmetry units) searchcoil data from EMFISIS. The EFW team then applies gain/phase calibrations to turn these channels into physical units (e.g. nT). [NOTE that these calibrations are not applied to the L1 burst files available through this website. Please contact the EFW team for access to calibrated burst data.]. Cross-instrument and satellite comparisons confirm the gain calibrations, and Poynting flux observations showing chorus wave propagation away from the magnetic equator indicate proper phase calibrations. 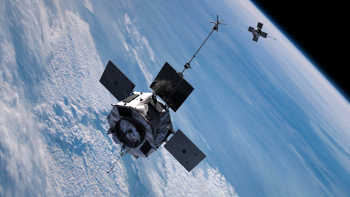 The Radiation Belt Storm Probes (RBSP), now known as the Van Allen Probes, are part of a NASA mission under the Living With A Star program. The mission consists of two spacecraft to study the Earth’s radiation belts. The twin spacecraft have an instrument complement designed to measure energetic particles over a broad energy range and the electric and magnetic fields responsible for the particle dynamics. The spacecraft orbit in the near equatorial plane with an apogee of 5.8Re and a perigee of 600km. This orbit allows the spacecraft to continously monitor the region of space near the earth where the most powerful particle acceleration mechanisms operate. The RBSP-EFW instrument will investigate the structure and dynamics of electric fields responsible for plasma transport and energetic particle acceleration in the earth’s inner magnetosphere. The EFW instrument consists of a data processing unit, four spin-plane electric field booms and two spin-axis booms. The investigation will further our understanding of particle energization, scattering and transport, and the role the large-scale convection electric field plays in modifying the structure of the inner magnetosphere. The PI for the RBSP-EFW team is Professor John Wygant at the University of Minnesota, School of Physics and Astronomy. John Bonnell leads the hardware development effort at the Space Sciences Laboratory at the University of California Berkeley (SSL). SSL provided the instrument data processing unit, four spin-plane booms and two axial booms for each spacecraft. Robert Ergun leads the EFW hardware development effort for the Digital Fields Board at the Laboratory for Atmospheric and Space Physics at the University of Colorado, Boulder (LASP). The investigation’s Science Operations Center is at the University of California, Berkeley Space Sciences Laboratory.